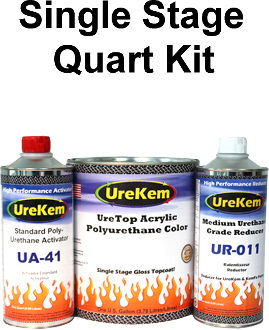 UreTop Solid Color Urethane Topcoat 1.5 Quart Kits - Buy Custom Paint For Your Automobile Or Motorcycle At Discount Prices! This listing features a kit containing a full QUART of a UreTop Polyurethane Topcoat SOLID color your choice, a HALF PINT of activator and a HALF PINT of reducer. 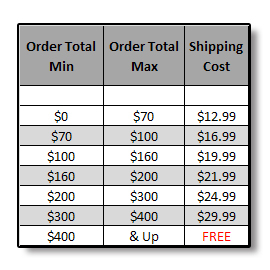 Available in 35+ colors including This chart contains a nice blend of shades including; super bright white, wimbledon white, bone, glacial white, smooth grey, pale yellow, viper yellow, canary yellow, golden harvest, grabber orange, lava orange, hugger orange, jalapeno red, viper red, solid candy apple red, peach, light pink, hot pink basecoat, solid magenta, maroon tide, solid lavendar, true purple, solid purple haze, rich brown, rugged brown, light aqua, solid turquoise, grabber blue, bright blue basecoat, indigo blue, mint, sublime lime, vibrant green, solid teal, solid forest green, electric lime, aqua basecoat, Super Jet Black Basecoat.